CBS Sports and RAYCOM Sports on-air talent Tim Brando has been selected by the College Sports Information Directors of America (CoSIDA) as the 2009 winner of the Jake Wade Award. This will be the 3rd Consecutive year a member of the CBS Sports team has been recognized with this honor. This award, which is selected by the CoSIDA membership, is presented annually to an individual who has made an outstanding contribution in the media to the field of intercollegiate athletics. Information Directors of America (CoSIDA). The award is named for Jake Wade, the widely acclaimed sports journalist and national magazine contributor for the Charlotte Observer and Sports Information Director at the University of North Carolina from 1946-62. Brando joined CBS Sports in 1995 as a play-by-play announcer for the NCAA Men's Basketball Championship and has served as host of “College Football Today”, CBS's pre-game studio show, since 1998. In addition, he has called play-by-play for “The NFL on CBS” and has hosted “At the Half”, CBS Sports’ college basketball halftime studio show. 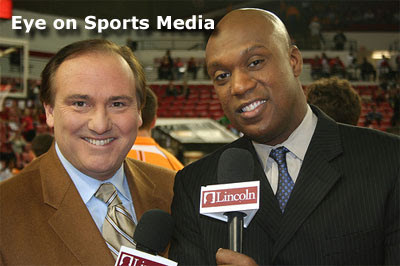 Brando also calls play-by-play for coverage of Southeastern Conference (SEC) and Atlantic Coast Conference (ACC) basketball broadcasts. He hosts “The Tim Brando Show” every afternoon on Sporting News radio. He has covered more than 25 different sports throughout his broadcasting career. Brando called play-by-play for CBS Sports’ regular-season college football coverage in 1997 and for the 1998 Fiesta Bowl. He has called play-by-play for SEC football games and SportSouth Television’s coverage of the NBA’s Atlanta Hawks and MLB’s Atlanta Braves. He was the studio host for “SportsCenter”, for ESPN's college football halftime show (1986-94) and for ESPN’s coverage of the NCAA Men's Basketball Championship (1987-90). In addition, he served as a play-by-play announcer for TNT during the 1994 NBA Playoffs. From 1981-86, he was the sports director at WAFB-TV Baton Rouge and the voice of LSU basketball games. A 1978 graduate of Northeast Louisiana University with a degree in television/radio management, Brando is a native of Shreveport, La., where he lives with his wife, Terri, and their two daughters, Tiffany and Tara.